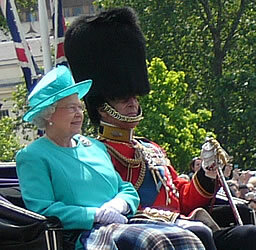 The British queen - Queen Elizabeth the Second - has two "birthdays". As well as her actual birthday (in April), the tradition is that the king or queen has an "official" birthday in early June (on the second Saturday of the month). 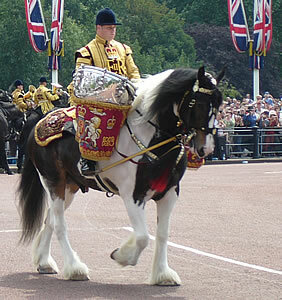 This is when the "Trooping the Colour" parade takes place, involving about 1000 soldiers, 300 musicians and 200 horses (there are practices known as "reviews" on each of the two Saturdays before the main event). 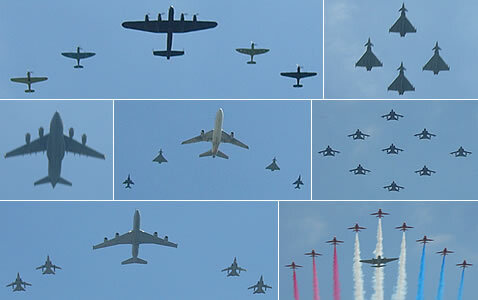 The photos on this page were taken in 2004, 2005, 2006 and 2007. Tickets are required to watch the main Trooping the Colour ceremony on the parade ground, but anyone can stand on The Mall (to the south of Green Park or to the north of St James's Park) to watch the arrival and departure. 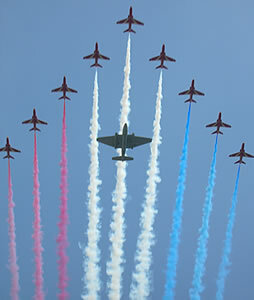 The event is broadcast live on BBC1, and highlights are shown later on the same day on BBC2. 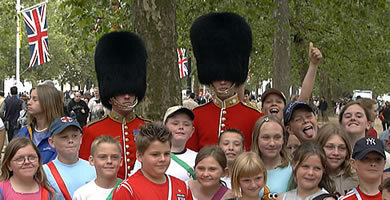 In 2011 Trooping the Colour is on Saturday 11 June. The event starts at about 10am, when the first band leaves Wellington Barracks (on Birdcage Walk, on the south side of St James's Park). 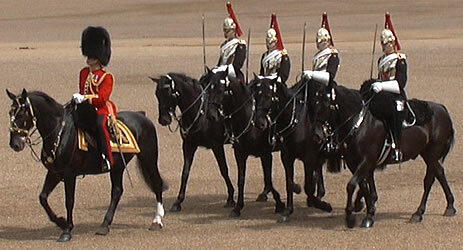 It passes Buckingham Palace before marching down The Mall to Horse Guards Parade. Other bands and foot soldiers follow soon afterwards. 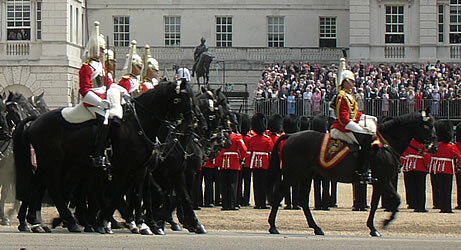 The mounted guards arrive from Constitution Hill (on the south side of Green Park). 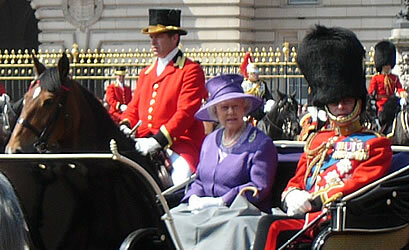 The Queen enters her horse-drawn carriage outside Buckingham Palace at about 10:50am and is escorted to the parade ground, where the troops have all assembled. 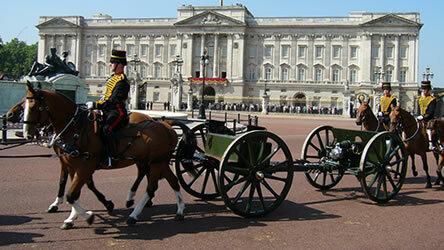 Senior members of the royal family leave Buckingham Palace at 10:45am. 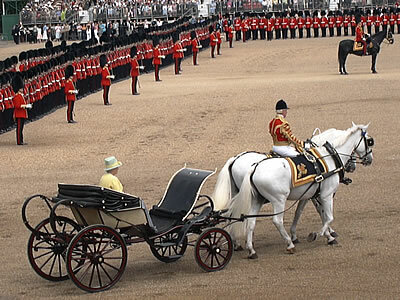 The Queen's horse-drawn carriage leaves at about 10:50am and is escorted along The Mall to the parade ground, where the troops have all assembled. 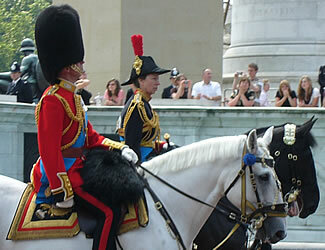 The Trooping the Colour ceremony takes place on Horseguards Parade between 11am and noon. 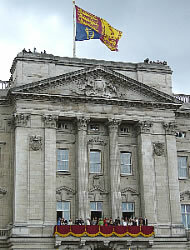 The Queen's flag (the Royal Standard) is raised at the top of the building while she is there. The soldiers who take part in this event do not just guard the Queen and take part in ceremonies - they also train and fight if necessary. 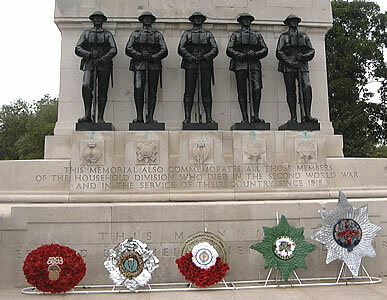 Opposite the place where the Queen sits is the Guards Memorial - this has been put up to remember those members of the Guards who lost their lives in the World Wars and other conflicts. 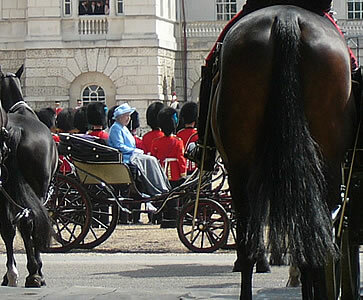 The Queen rides past the soldiers in her coach, inspecting them. She knows what standards to expect, as she has performed this duty every year since she became Queen (except in 1955, when the parade was cancelled because of a national rail strike). 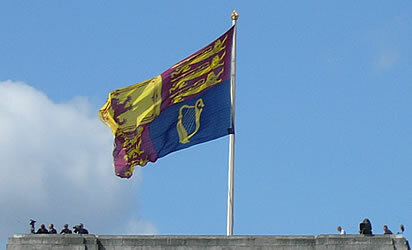 The "Colour" is a flag representing a regiment (section) of the army. Many years ago, this flag was used to show soldiers where to gather during battles or at other times. It was important for everyone to be able to recognise his own Colour, so it was shown to all the soldiers at the end of each day. 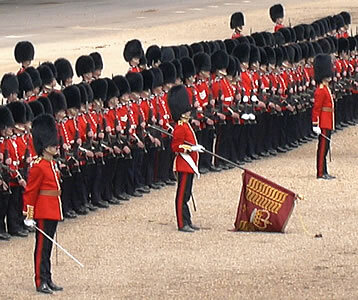 The Trooping the Colour ceremony is largely based on this tradition. 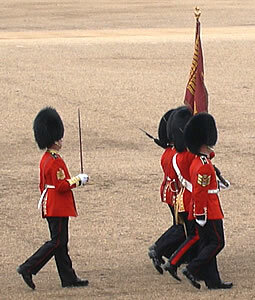 Although the Colour is no longer used while fighting, it remains an important symbol of the regiment and its history. 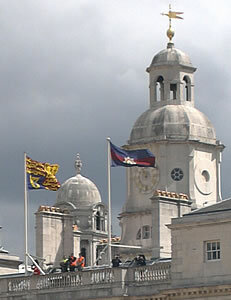 Battles in which the soldiers from that regiment have fought are shown on the flag. Each year, the flag of one of the regiments of the Household Division is chosen to be the Colour. 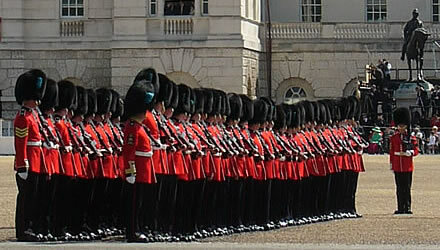 The Colour is taken in front of all of the soldiers on Horseguards Parade, and is saluted as it goes past. 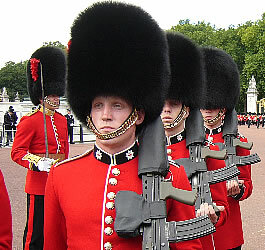 Members of the chosen regiment are responsible for the ceremonial and guarding duties at Buckingham Palace immediately after the Trooping the Colour ceremony. 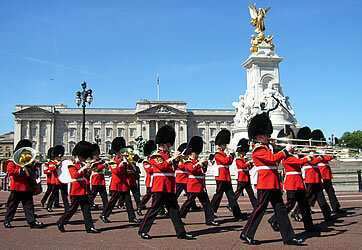 During the ceremony, military music is played by the Massed Bands and Corps of Drums of the Household Division. 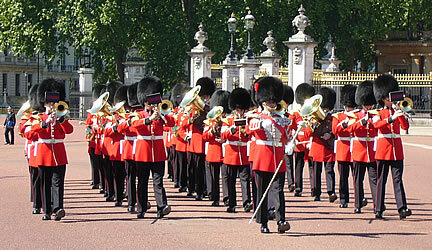 Each of the divisions of the Household Division has its own tune used for either a slow march or a quick march. Some of the musicians play while they are riding horses. The person who plays the large drums needs both of his hands to play, so he must control his horse using his feet! 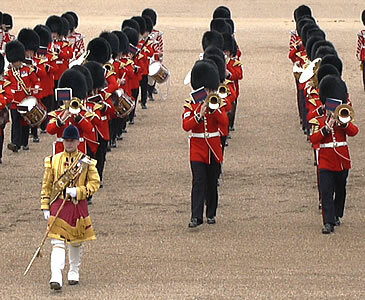 The Grenadier Guards "The March from Scipio" (Handel) "The British Grenadiers"
Coldstream Guards "Figaro" (Mozart) "Milanollo"
The Welsh Guards "Men of Harlech" "Rising of the Lark"
The Irish Guards "Let Erin Remember" "St Patricks Day"
The Scots Guards "Garb of Auld Gaul" "Heilan Laddie"
The Foot Guards are perhaps the best known members of the Household Division, because visitors to London can see them guarding the front of Buckingham Palace. 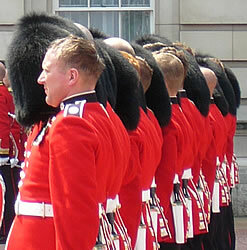 Soldiers must walk in step with each other, and they perform quite complicated turning manoeuvres. As well as the foot soldiers, there are also several hundred soldiers mounted on horseback. The horses are very well trained - they must walk close to each other and remain calm at all times. 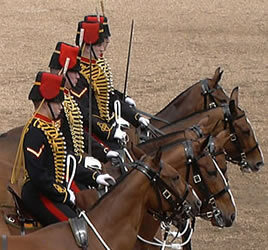 Gravel has been laid out on Horseguards Parade to allow the horses to walk easily. 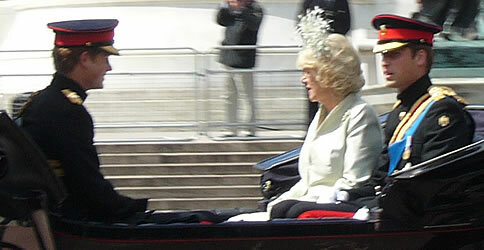 On the birthdays of the Queen and Duke of Edinburgh, and on the anniversary of the Queen's coronation, it is traditional for cannons to be fired from Hyde Park, the Tower of London and Windsor Castle. 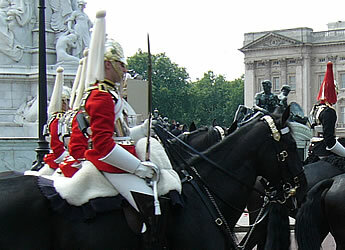 On the Queen's official birthday (the day of the Trooping the Colour ceremony) there is a gun salute in Green Park at 12:52pm - 41 guns are fired by the King's Troop. This can be heard clearly from Buckingham Palace. 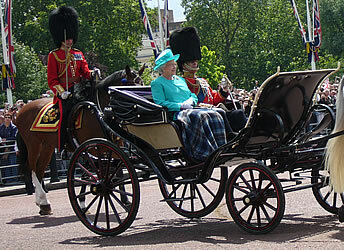 Once the ceremony has finished, the Queen returns along the Mall to Buckingham Palace. Crowds line both sides of the road. 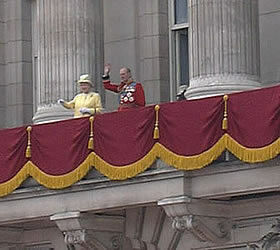 After arriving back at Buckingham Palace, the Queen and other members of the royal family appear on the palace balcony to greet the crowds. In 2006 there was a special tribute on the Forecourt of Buckingham Palace to mark the Queen's 80th birthday. The guards fired into the air and the band played the National Anthem (God Save the Queen) - this was repeated three times. 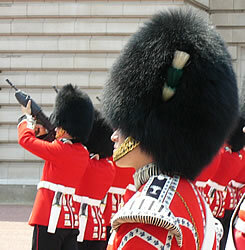 The guards then removed their bearskin hats and gave three cheers to the Queen. 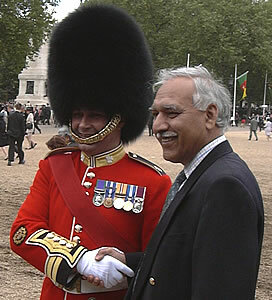 After the event some spectators took an opportunity for a photo with members of the Household Guards. It seems that they also have one new young recruit ... !